All your Direct Mail services under one roof. Data Management, Addressing, Inserting, Tabbing, Mail Lists. SB Mailworks is now part of the JANO family. JANO Printing & Mailworks Direct Mail Services are second to none. All the Direct Mail Services you need for your business are under one roof at JANO. Data management, addressing, inserting, tabbing, fulfillment, mailing lists, compliance, targeting and of course…printing! Stay ahead of the competition by getting to market faster with JANO. We offer the best direct to consumer marketing products, combined with in-house, on-demand digital & variable data printing, list management, USPS & HIPAA compliance, fulfillment services – all at a speed that gets you to market faster than the competition. Profitable direct mail is all about bottom line and ROI. Cost and speed to market have to be minimized while high quality mailings and pinpoint messaging are used to maximize your conversion rate. That is where being a G7 Certified Master Printer and the area’s biggest direct mail service pays off for your business. More secure, faster, less expensive – JANO delivers increased ROI for your business. Get top ROI results from your campaigns by working with smarter, more refined, clean data sets. Our Data Management Services Team can source and create lists for your campaigns or manage your existing lists. Using targeted, up-to-date, vetted lists increase your ROI. We also offer ‘every door direct mail’ or EDDM lists, zip code targeting, area code targeting and demographic targeting along with RTS (return to sender) loop configured to keep your list clean and profitable. JANO Direct Mail Fulfillment Services (sorting, addressing, folding, inserting, tabbing) are all done on the latest high tech equipment. Automation plays a big role in keeping costs down and ROI up for Direct Mail. We use top of the line machines from trusted industry leaders like Duplo, Kirk Rudy, Pitney Bowes and Heidelberg to make your message into high quality, actionable direct mail campaigns that lead to higher conversion rates. You don’t have to limit your imagination with JANO Direct Mail. Bi-fold, tri-fold, postcard, window envelopes, larger format mailings are just a few of the possibilities. High-end, intricate and creative campaigns increase your open rates and your end user’s ‘open experience’ leading to more conversions. JANO can create anything you can think of without limits because we are a G7 Master Printer. The first rule of direct mail is get it there. You have to get your message in the hands of your targeted audience to have any chance to convert. JANO stays abreast of all USPS compliance rules and regulations and apply them to every campaign. 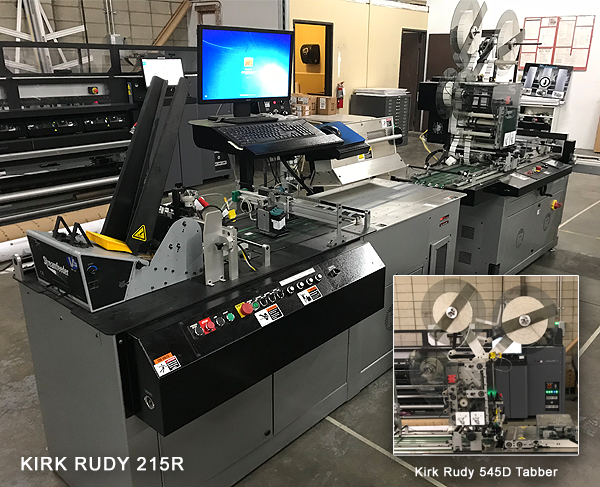 Our tabbing machines provide virtually error free USPS compliance for folded and custom direct mail so there is less waste and lower RTS (return to sender). Strict compliance insures the highest delivery rates possible. Higher delivery rates mean maximizing the potential pool of customers for your business and less waste and more profit. We are a 100% HIPPA compliant facility with physical, network, and process security measures in place to protect sensitive data. We take security seriously and are constantly upgrading and updating our systems to protect our customers and their data. At JANO, we know that data can be your businesses’ currency. Losing data is losing money. That’s why data security and protection of your intellectual property are top priorities at JANO. Our HIPAA compliant facility and in-house printing services mean your data and creative property never leaves JANO unless you say so. Our HIPAA compliance program includes shielding your data from the Internet and any other external exposure, providing a secure facility with controlled entry/exit points, strict employee guidelines, training, policies and background checks, closed circuit video surveillance, regular third party vulnerability assessments and streamlined pre-press processes to minimize file handling. Trust JANO to protect your interests by taking security to the next level. Return on investment is everything in marketing and especially direct mail marketing. Increase ROI by using JANO. Your success is our success.